The US Mint news of the week circled around the inaugural Buffalo Gold Proof sales. 19,468 were sold in four days. That was 123 shy of the 2008 Buffalo Proofs. The 2009 bullion versions are on fire as well. They were released on Oct. 15 and are now at 121,000 — 51,000 short from matching the 2008s. American Silver Eagle bullion coins officially recorded their best October ever, reaching 2,939,000 in the month. The US Mint has yet to report any November numbers, but the final two months of a year are generally very strong for eagles. American Eagle Gold coins finished last month with sales of 115,500, making October the 5th best ever for the series. UHR $20 Double Eagles recovered from the dip that took weekly sales to their second lowest level ever. 1,045 more were scooped up by collectors, bringing the new total to 102,311. Three of four Braille Silver Dollar products performed better than the last round. The Braille Education Set, which went on sale Oct. 15, declined slightly with 793 versus the prior 1,004. In related news, the US Mint announced this week that it would stop selling Braille dollars after 5:00 p.m. ET on Dec. 11. For the record, a total of 202,655 of the authorized 400,000 silver dollars have been sold. As mentioned, the 2009 US Mint Set and US Mint Proof Set scored large gains. New sales showed respective increases of 18,080 and 23,469. The Mint Sets are standing at 512,563. Seven of ten First Spouse Gold Coins improve over the prior week. The last report showed just three of ten performing better. The non bullion coin sales figures above have an "as of date" of Nov. 1. The previous reported sales figures are located here. 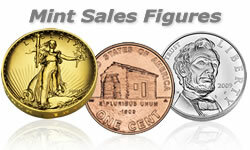 For an always updated reference of the latest articles, visit US Mint Sales Figures. 121,000 Buffalo Eagles were sold in 2009 as of Nov 4.
of Gold Eagles, I want some of those Buffalo Eagles. Can I get some before pigs fly or do I have to wait? And what do you figure for the price — in ameros?